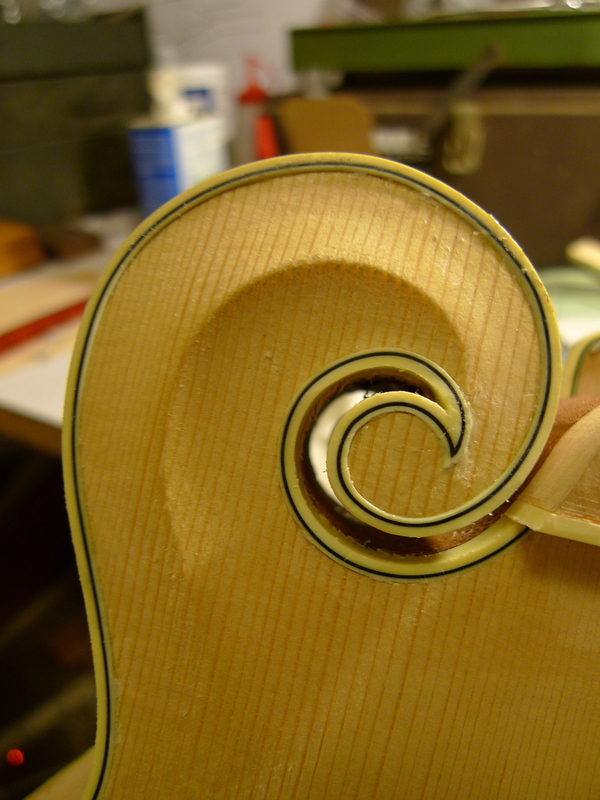 Awesome stuff has been happening in the C. Miller lutherie shack lately, with the Arches F5 kit approaching completion. 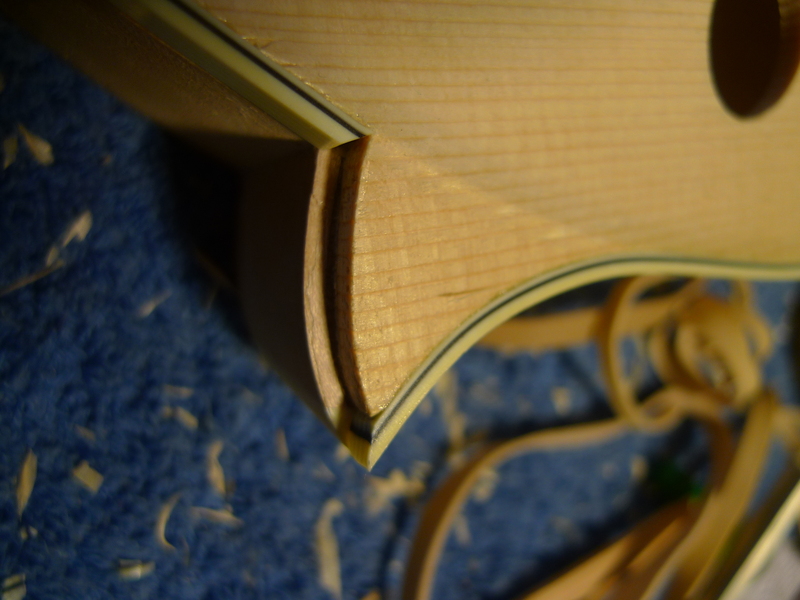 While we have completed the Finishing and Repairs classes, I’ve been burning the midnight oil working nights and weekends getting the mandolin kit further along. For those unfamiliar with the F5 mandolin, it is a design that came into being in 1922, being a new iteration of Gibson Florentine mandolin designed by the virtuosic musician and sound engineer Lloyd Loar and Guy Hart, another Gibson designer. Taking cues from violin construction, Loar sought to create the ultimate mandolin at a time when the great surge of mandolin popularity was waning. While not a huge success when they were new, they have been coveted, envied, and oft copied ever since. Lately, I’ve been loving playing fiddle tunes on the mandolin, and have been craving a fine instrument to play. Not having the funds to purchase a handmade mandolin, I decided to put my fledgling capabilities to the test by assembling a kit. The Arches kit is pretty impressive. 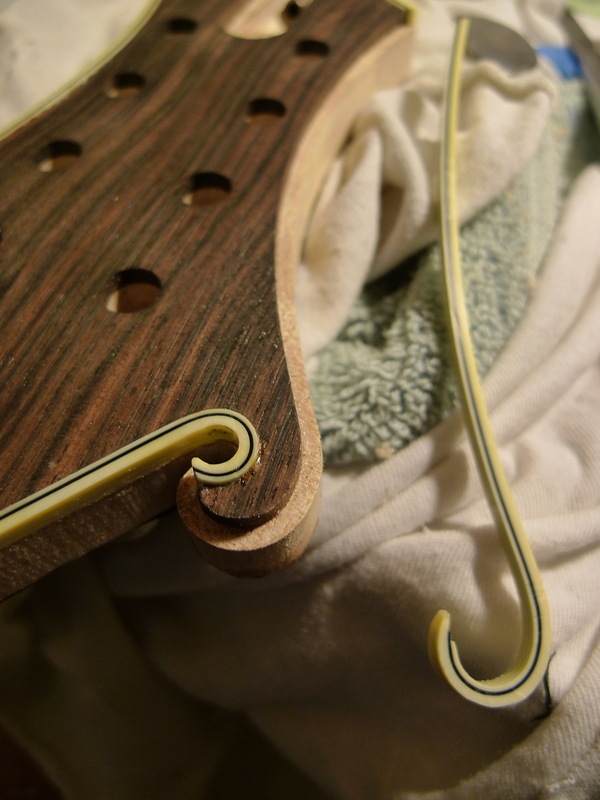 With CNC’d top, back, and neck, it presented a reasonable amount of assembly tasks. 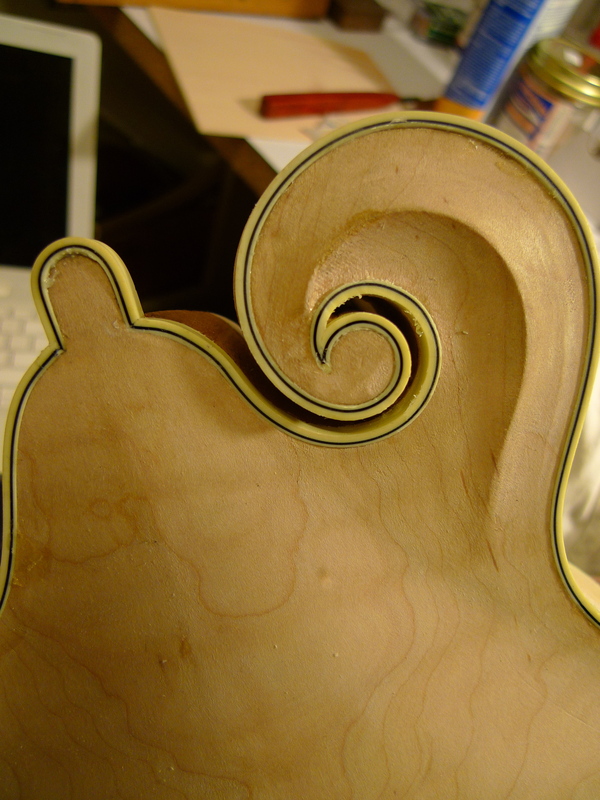 One of the great features is that the scroll binding channels are already routed. This is a huge timesaver. I am so impressed with the beautiful design of the F5. Exquisite from every angle. I feel like I cheated by having so much completed for me, but I’ll surely build from scratch from here on out. I’ve just finished installing the binding, next will be to fill any gaps with a slurry of celluloid and acetone. Celluloid, while flammable, is a wonderful material to work with. I think I enjoy the smell of camphor and acetone a little too much for my own good. 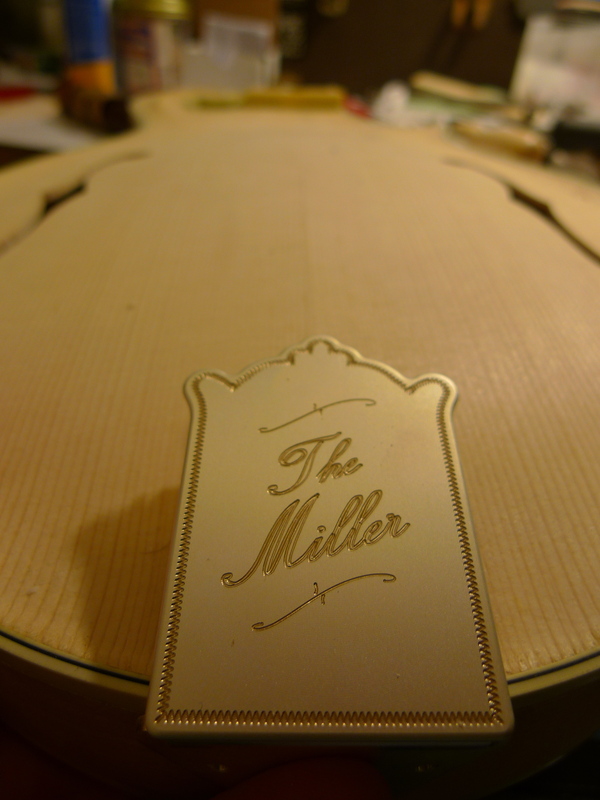 To top it all off, I went wild and ordered a Bill James tailpiece with “The Miller” engraved into it. I was able to drive over to Bill’s shop in Maple Plain and watch the CNC do the engraving. 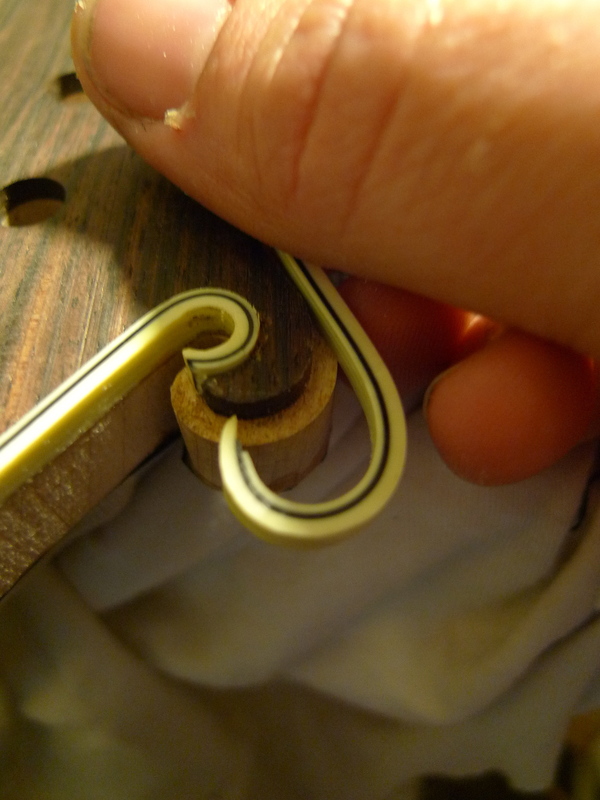 I’m not ashamed to say that it is the coolest thing ever, and clearly the nicest mandolin tailpiece out there. 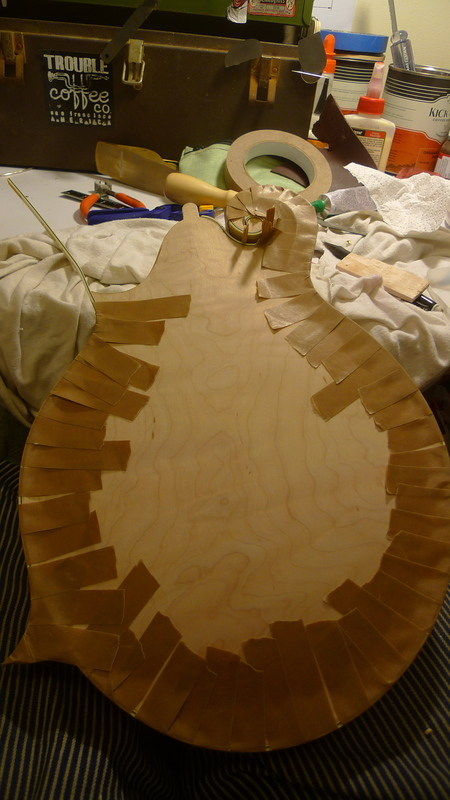 Next up will be to scape the binding down to level, clean up the body to ready for final sanding, glue in the neck, inlay the headstock with the lovely pearl flowerpot, install the fingerboard, tailpiece, endpin, fit the bridge and tuners, dress the frets, and string it up for final voicing before it gets a sunburst! 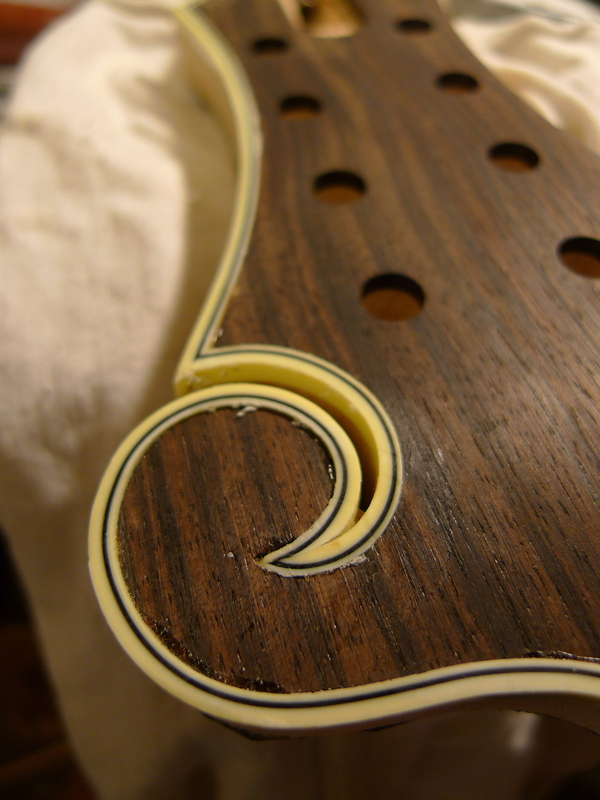 The mandolin looks beautiful already…….like the name. is that a one piece back? 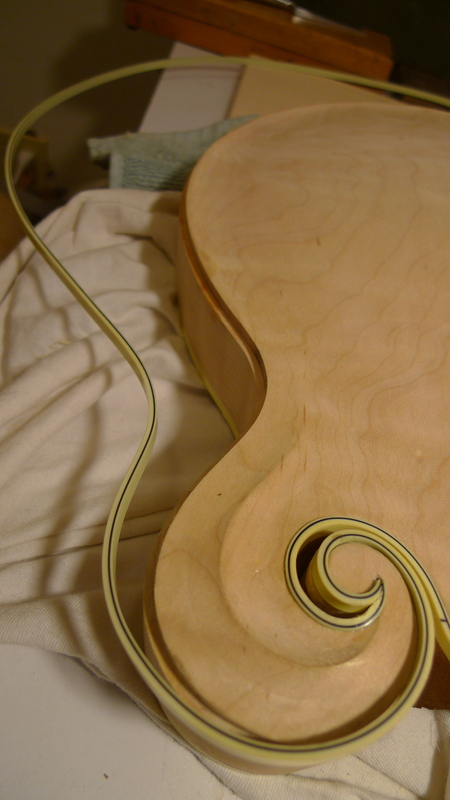 nice purfling joints! Yessir! One piece flatsawn maple. 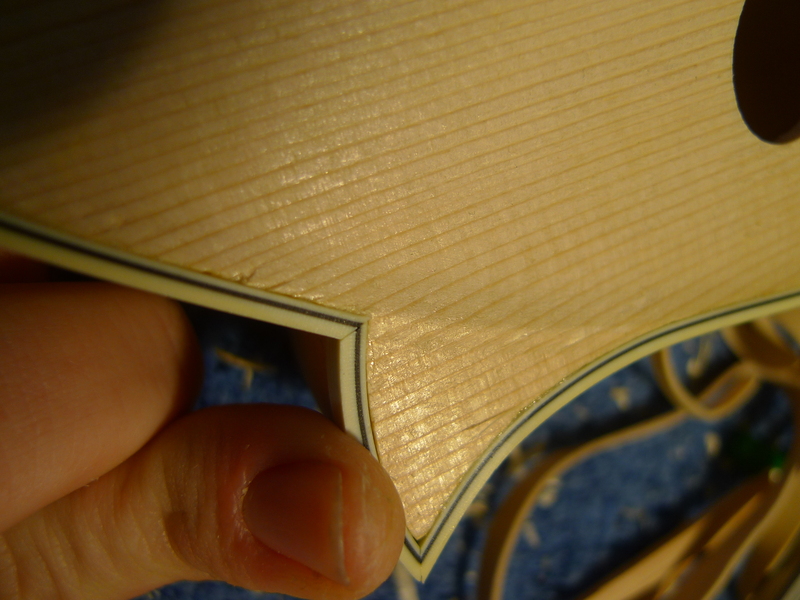 Those miters are fun, you should try it after you finish your bow! What tool did you use to cut the binding to the exact angle and length? Any tips you might be able to offer us? What was the best way to glue the binding on to get the best results? 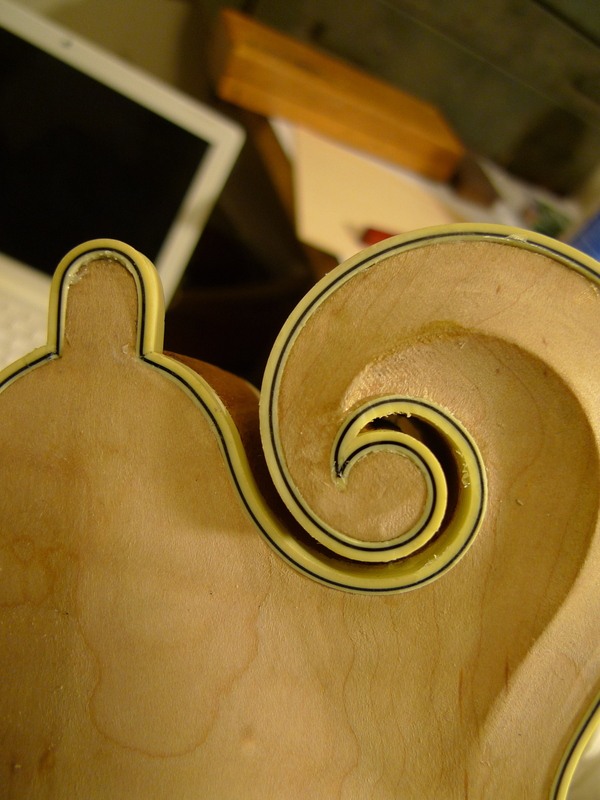 I used a 1″ chisel to cut miters. I keep the all of the backs of my chisels lapped flat, but I keep the 1″ polished to a mirror finish. That way, when you cut the miter, you can see the angle of the binding in the mirrored finish. It takes some practice! I needed to buy extra binding, as my learning curve for the bending and mitering required more to practice with. For an excellent tutorial, buy the Spring 2013 (No. 113) issue of the American Lutherie Journal (www.luth.org). 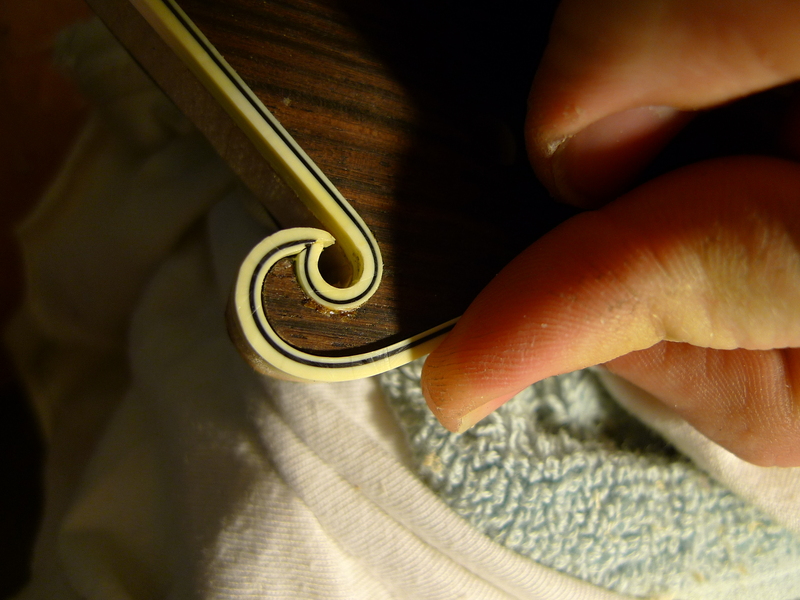 In it, builder Andrew Mowry tells all about his binding technique. I found it extremely helpful. I use a acetone-thinned Duco cement for celluloid binding; it is readily available at the local hardware store and works great. One thing that I noticed is that the binding swells slightly with the acetone contact, and it is a good idea to give it some time (like a week or more) to shrink back before scraping.